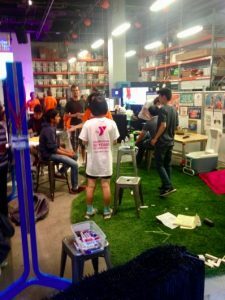 The San Jose Tech Museum Of Innovation is nestled in the heart of the major technology hub of Silicon Valley, California. The huge building in the heart of Downtown has science and innovation stuffed under its roof. Comprising of eight exhibition areas. 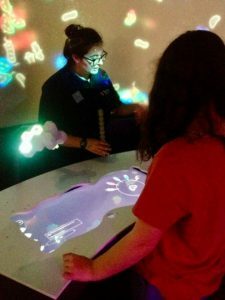 It offers immersive, hands-on learning for all ages. We started off with having our faces sketched by a robot. 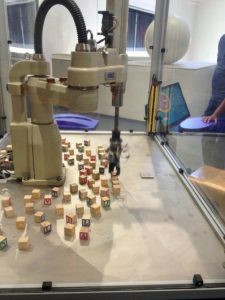 No, it was no Leonardo Da Vinci but it was fun to see the robot hand pick up a pencil and jerk from side to side, up and down whilst putting pencil to paper. Another robot in the same exhibition area was able to pick up wooden alphabet blocks to spell out your name (or whatever you typed into the computer). When we were there this area was heaving with children working together in teams. They were attending a workshop to participate in learning experiences that reinforce scientific methods and the design process. Topics covered are DNA & Genetics, Electricity, Physics of Roller Coasters, Creating a multi-tasking social robot. Interactive exhibits to showcase the intelligent design in living things. ‘what if’ and ‘then’ statements by using plastic connective strands to get the results you want. 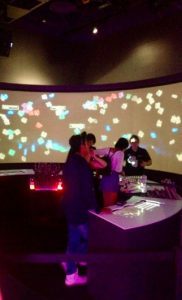 You then release your creature onto the screen and it interacts with other creatures created by other visitors. 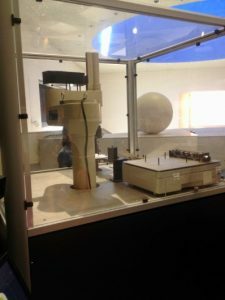 We found this a really interesting exhibit that demonstrated the programming process well. Collaborations with businesses and organizations such as Facebook, Stanford University, and Hewlett-Packard. Birdly – A virtual reality flight simulator with actual moving wings that your arms are strapped into to guide and power your flight. 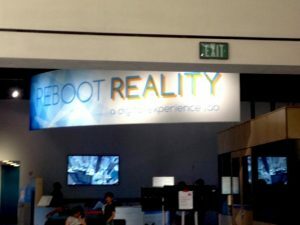 Stanford VR – Virtual reality simulation headsets the allow you to experience virtual cityscapes. Wetbrush Adobe – A digital art studio that recreates the look and texture of oil painting. It was really easy to use and the effects were incredible. 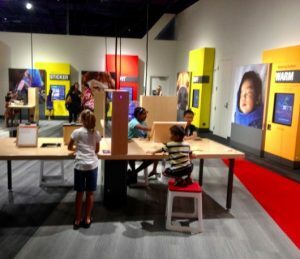 A collaborative design space which offers guided STEAM (Science, Technology, Engineering, Art, Math) experiences, in ‘construct’ and ‘create’ type workshops. 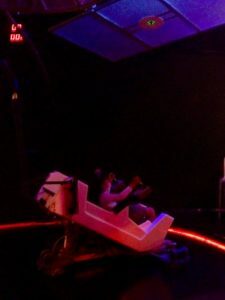 Take a ride in a chair resembling a NASA manned maneuvering unit (MMU). One of my favorite moments was discovering the lab producing building bricks made from mushrooms. 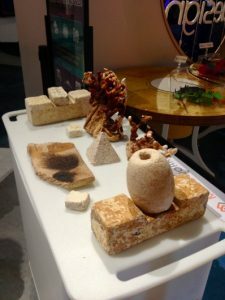 Mycelium bricks. They are super light and very durable! I am excited about the prospect of eco-friendly housing built with mushrooms. 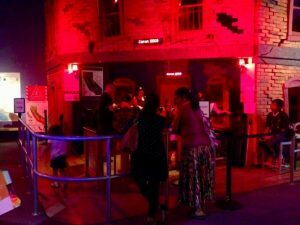 And we got to experience what it felt like to have the floor shake beneath us in a simulation of the Northridge, California earthquake back in 1994. With a magnitude of 6.7. It was actually a bit scary (and made us giggle) as it shook the floor beneath us quite violently. 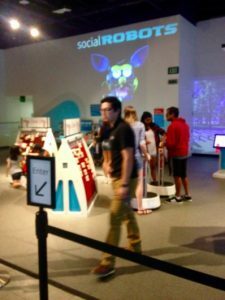 Go visit the Tech Museum. The let us know on our Facebook page what your favorite exhibit was.